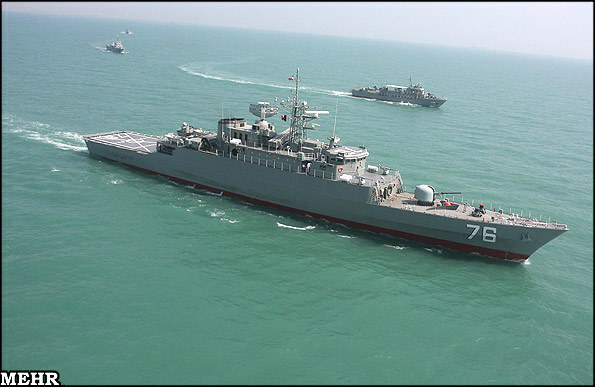 Sayyari added that the Jamaran 2 destroyer is being manufactured domestically under supervision of Iranian specialists. He also said the new destroyer model will be more advanced than the first "Jamaran" destroyer launched in the Persian Gulf waters in February 2010. First Jamaran "destroyer" (actually a light frigate considerng its roughly 1,500 tons displacement) was also domestically-manufactured, and it completed its first international mission on December 18, after conducting counter-piracy operations in the Gulf of Aden. The 1,420-ton destroyer, which is part of the 16th fleet of Iranian warships, is equipped with modern radars and electronic warfare capabilities. Jamaran destroyer has a top speed of up to 30 knots and a helipad. The destroyer features highly advanced anti-aircraft, anti-surface- and anti-subsurface systems. The vessel has also been equipped with torpedoes and naval cannons. Iranian Navy officials have earlier stated that the production of five other naval destroyers similar and even more advanced than the Jarmaran-class destroyers are on Navy's agenda. Admiral Habibollah Sayyari also said two "Ghadir" midget submarines were handed over to the Iranian Navy. "Ghadir" submarines were built by Iran specifically for cruising within the shallow waters of the Persian Gulf.